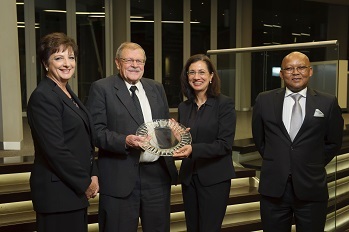 The University of Pretoria annually hosts a special gala occasion to pay tribute to academics that have shown exceptional achievement in the preceding year. Two new categories were added to the Academic Achievers Awards, namely the Vice-Chancellor’s book awards and an award to recognise innovative community engagement. The recipient of the Chancellor’s Award: Research was Prof Don Cowan, Director of both the Genomics Research Institute and the Centre for Microbial Ecology and Genomics. The Vice-Chancellors Book Awards for scholarly books, monographs or collections were awarded in the natural and applied sciences (Prof Jan Boeyens: The Chemistry of Matter Waves) and in the humanities and social sciences (Prof Lorenzo Fioramonti: Gross Domestic Problem). 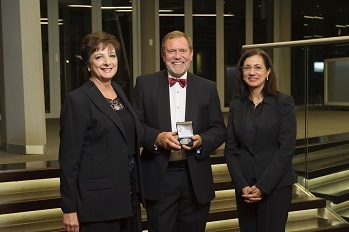 Chancellor's Award: Research winner Prof Don Cowan with the Vice-Chancellor and Principal, Prof Cheryl de la Rey and Vice-Principal: Research, Prof Stephanie Burton. One of the winners of the Vice-Chancellor's Book Award, Prof Jan Boeyens with Prof Cheryl de la Rey, Vice-Chancellor and Principal, Prof Stephanie Burton, Vice-Principal: Research and Prof Norman Duncan, Vice-Principal: Academic. Six academics were honoured as Exceptional Academic Achievers and two as Exceptional Young Researchers. The Teaching Excellence and Innovation Laureate Awards were made in an individual (Prof Tania Hanekom, School of Engineering) and a team category (Thea Corbett and Christine Kraamwinkel, BSc Extended Programme). The Community Engagement Award went to Dr Martina Jordaan for the Community-based Project (JCP) which is a flagship module in the Faculty of Engineering, Built Environment and Information Technology. 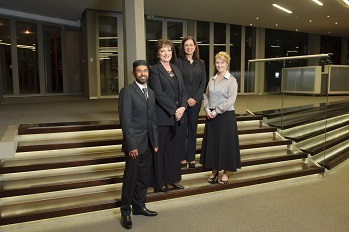 Honoured as UP’s Exceptional Young Researchers are Prof Naushad Emmambux (extreme left) and Dr Irene Barnes (far right) posing here with Prof Stephanie Burton, Vice-Principal: Research (centre left) and Prof Cheryl de la Rey (centre right). 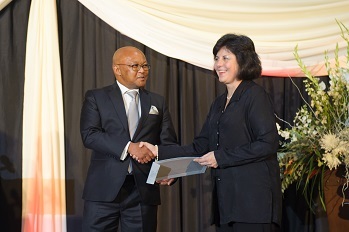 Dr Martina Jordaan receives the Community Engagement Award from Prof Norman Duncab, Vice-Principal: Academic. 91 UP researchers received new ratings or were re-rated by the National Research Foundation, including two who received A ratings for the first time, Prof Andries Engelbrecht (Information Technology) and Prof Yves van de Peer, part-time professor in the Department of Genetics.